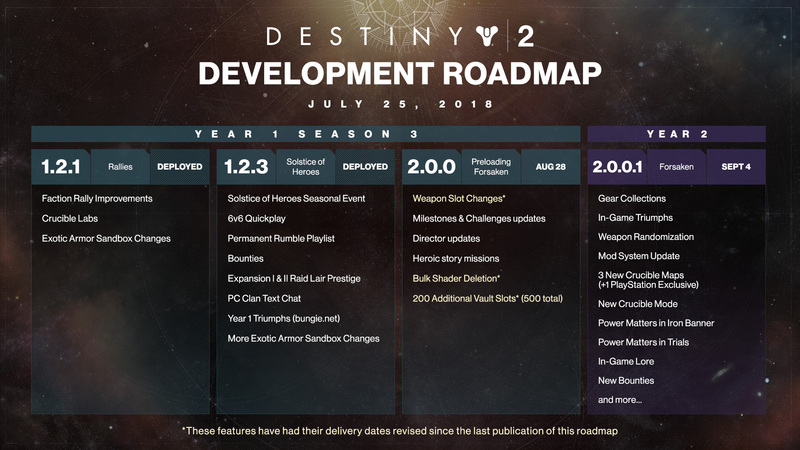 Bungie has announced changes to Destiny 2's update schedule leading up to the game's anticipated large-scale expansion, Forsaken, on Sept. 4. The game's 2.0 update will now come out on Aug. 28, a week before the expansion. This update will basically be a pre-load for the expansion, bringing a number of exciting changes to the game that previously were slated to arrive on Sept. 4. The star of the 2.0 update will be the highly anticipated changes to weapon slots. These adjustments will diversify the weapon pool, allowing players to equip more weapons in the different slots than before. If you want, you might be able to wield three shotguns or three snipers. It won't make much sense for ammo economy, but it's possible. Starting on Aug. 28, players will finally be able to delete stacks of shaders all at once, as opposed to deleting them one by one. Not only that, but 200 more slots will be added to the Vault, allowing storage of everything from weapons and armor to shaders and consumables. Also coming in the 2.0 update are updates to milestones and challenges, updates for the in-game director, and Heroic story missions. There's going to be a lot to look forward to before the DLC even hits. The 2.0 update sounds substantial, and rightfully so. This update will likely be a large one, containing most of the content from within Forsaken itself, while the Sept. 4 update titled "2.0.0.1" will be a key of sorts to unlocking all of the new content that was pre-loaded a week prior.